WordPress SEO by Yoast sure has grown up a bit since our last post about setting up the plugin! With all the changes that have happened, it’s time to review the process of configuring the plugin to help ensure SEO perfection. General Settings has a couple useful items, like the introduction tour. Other than that, you won’t spend much time here. You’ll want to make sure you have a website name plugged in. This can contain your name and possibly a keyword. For example: “NeONBRAND Digital Marketing” would be a great one. Be sure to configure whether you’re a company or a person, and then complete the requested fields for either a person or a company. Selecting company allows you to upload your logo, too, which you’ll definitely want to do. Wondering where all the meta verification codes went on Yoast? Here they are! When verifying site ownership on 3rd party sites, they’ll often ask you to add a snipped into the code of your site. This is where you would plug in those snippets. There is only one option on the security settings, and it allows access to advanced settings which have the potential to cause security issues. Use this at your own discretion, but for most sites, you will want this box checked. Those advanced features probably won’t be necessary. This is a very important section to configure, as these are the default SEO settings for your entire website. The tabs are all very similar in structure, and Yoast provides tons of helpful messages along the way if you do something wrong. I really like the feature found on this page called “force rewrite titles” – 9 times out of 10, I have this enabled. 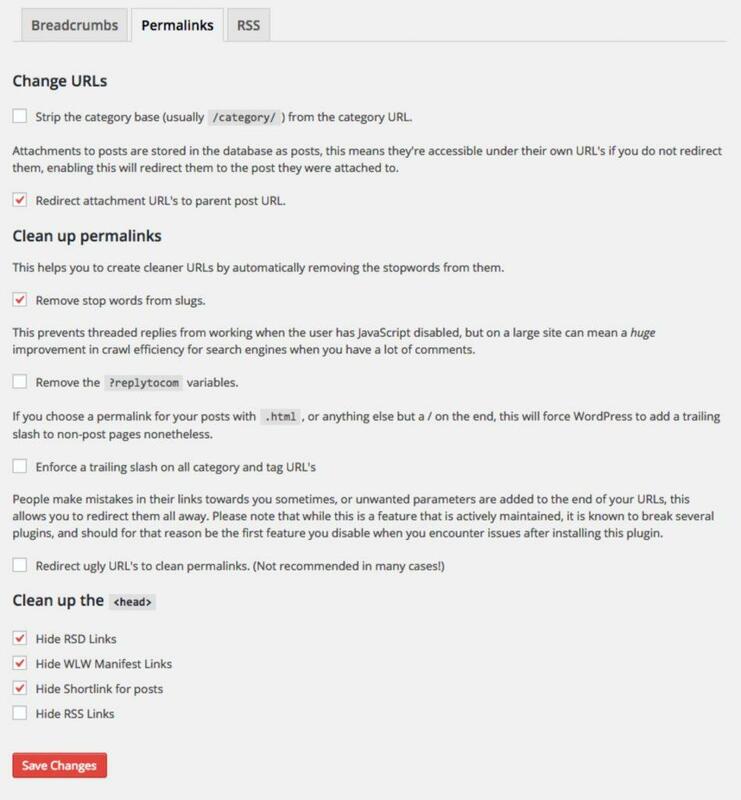 It overrides any default theme settings and cleans up your titles so they’re the way you want them to be, instead of how your developer may have configured them. The title separator is also nice, and is totally left to user preference…although I believe there is a sweet spot in Google for those that use the vertical line separator. 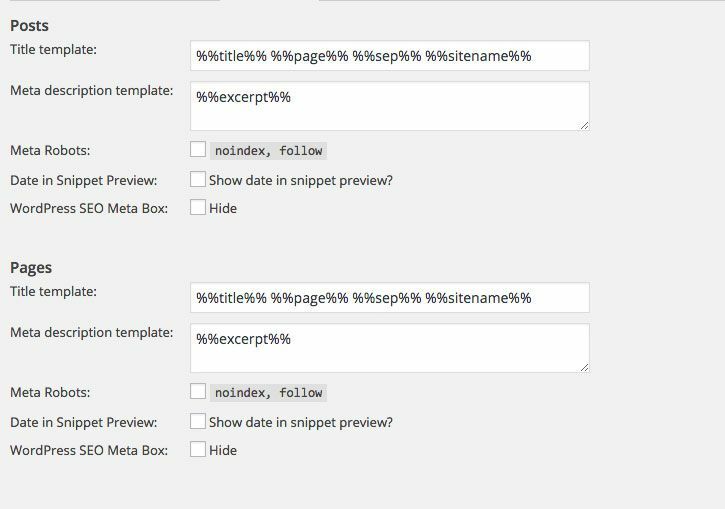 If you have a widgetized home page or dynamic blog page, you may have wondered in the past where the heck you can set the page title and description. Yoast has given you that option right here on this page. Thank goodness! If you don’t have a widgetized home page, then you can edit the title and description right on the page itself. These pages are awesome, as you can really set a lot of default settings for your SEO optimization. Each default is easily overridden by changing the options on a post by post (or page by page, or category by category, etc) basis. But for starters, you’ll need to know exactly what you can type into these boxes. %%sep%% The separator defined in your theme’s wp_title() tag. %%ct_<custom-tax-name>%% Replaced with a posts custom taxonomies, comma separated. 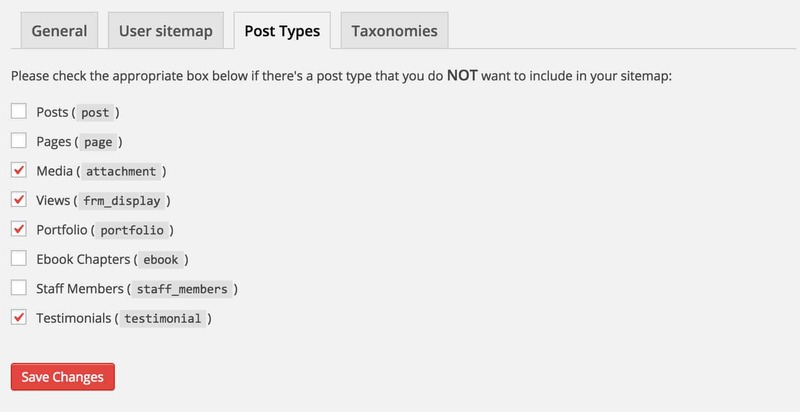 By default, without you ever having to change anything on your pages or posts, it will create the title and description tags for you based off of the above formulas. Without something like this in place, those items are left unset and Google doesn’t know what you want your title or description to be. Make sure these are set! 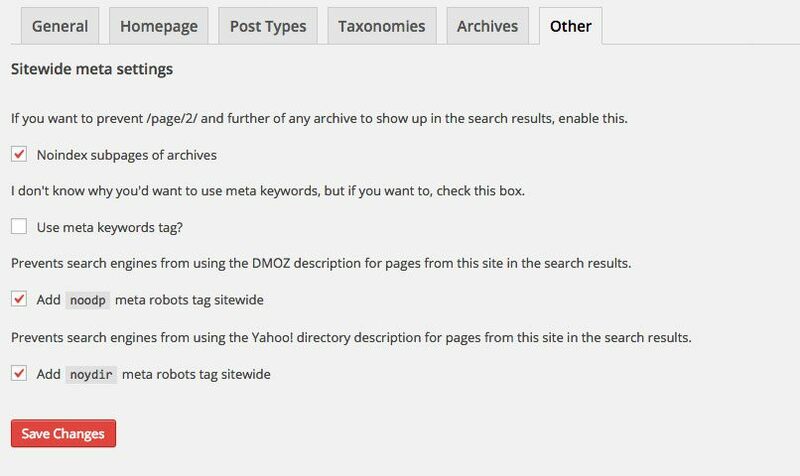 The taxonomies and archives tabs are very similar to the post types tab, and will have a similar look and feel. You should be fine configuring those yourself. The other tab has some interesting settings. 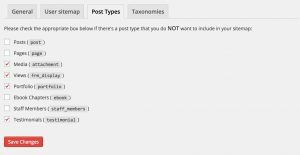 One of the problems with WordPress when it comes to SEO is that it creates a LOT of additional pages with the archives of posts, categories, and taxonomies. These can cause issues with duplicate content, and ain’t nobody got time for that. Check the top box to unindex a ton of the paginated results from Google so that you don’t have to worry about that issue. And if you really want to control your SEO descriptions, be sure to check the bottom two boxes too, as you don’t want Google to pull from other resources to try and explain what your site is about. Yeah, don’t check that box. 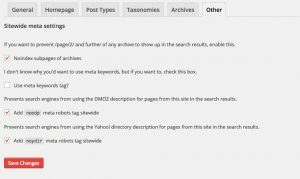 This is a great new section to version 2.0 of the Yoast SEO plugin. He’s really brought together all the social requirements together in one place. It’s really self explanatory – just make sure you fill out as much of each tab as possible. Get your social accounts setup! Then, come back here and plug in the URL’s, or in Twitter’s case, the username…come on Yoast-onians, be consistent! I recommend checking the box at the top of the page to “add open graph meta data” to your site. This helps Facebook know what is on each page, so when your content gets shared on Facebook, they correctly populate all of the default options. Without this, you’re leaving it up to Facebook to try and guess what to put in for your title or description. I also connect up my Facebook admin account to collect additional insights, but this isn’t necessarily required for a good SEO experience. As easy as checking the box. You’ll want to have your site verified with Pinterest. This is where you can plug in the little code they give you in order to complete the verification. Nobody uses Google+ and we totally agree with that. The problem is, Google sure the heck does, and they reward those who use it. My bet is that the whole network will get broken up into smaller pieces, but until that time comes, you’ll need a Google+ page, and this is the tab where you plug in the URL. Then, deactivate any plugin that might already be creating an XML sitemap for you. You’ll want to use Yoast’s feature, since it’s about a million times better than everyone else’s. 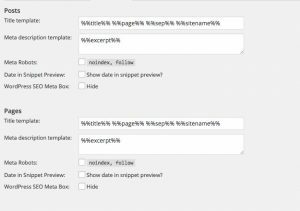 The main purpose of the XML sitemap is to create a nice, organized structure of your entire website so that Google knows where all the pages go, and when pages are updated and/or released. The plugin will also notify the search engines whenever you add new content, which is always a good thing. For starters, there is a nice big button at the top of this tab that gives you a link to your dynamically created XML sitemap. You’ll need to submit this to Google via the Search Console. I’d leave the other setting as is, unless you start experiencing issues. If you have a multi-author blog, you may want to have the author sitemap enabled. Although, with the recent dump of authorship data, this is probably unimportant. I have the Disable button checked on my site. Yes, these really are considered post types. Now, why would you want to check any of these boxes to EXCLUDE these post types from your sitemap? The main reason is that sometimes, these post types are created and you don’t actually use them on your site. It doesn’t do you any good to include them in your sitemap, then. Go ahead and check those off. Taxonomies are very similar to post types. There are a few defaults (categories, tags & format) and then the remaining are custom taxonomies. The same rule applies: if you’re not using the taxonomy, it doesn’t do you any good to include those in your sitemap either. Check off the ones you don’t use. All are really important, and they’re not too advanced for the average user, even though there is a little bit of code that accompanies some of these settings. If you don’t know what they are, they come from the fairytale classic Hansel & Gretel. Remember how they found their way home? They left breadcrumbs along the way. To enable this feature, just check the big fat checkbox at the top of the page. There are a few minor settings to configure, but the defaults are good. This does require a teensy amount of programing, and Yoast has already provided this handy little guide on how to set that up. The RSS tab allows you to manipulate the automatic output of your RSS feed. Sometimes, people use scrapers to take content from other sites. To circumvent that, you can plug in something either before or after the content of the RSS feed to show where the content originated. You can use the little shortcuts here too. Yoast has them listed right on the page. These used to be more obvious, but I think Yoast was probably getting too many questions about pieces of his plugin that only about 1% of people ever need to use. Here, you’re able to edit titles and descriptions of all post types en-masse. If you’re really wanting to crank through a bunch of pages at one time, this is the way to do it. Sometimes, you might have to change an important file like your .htaccess or robots.txt. Be careful with those files. Irresponsible fiddling can break your entire site. Yoast knows that you may have another SEO plugin already installed, and changing over may seem daunting. Yoast smoothed all that over by providing a sweet little import tool to help with the migration from most of the other popular SEO plugins. We sure love Yoast and all it’s features. In fact, we’ve ranked sites using this plugin alone. This post only covers Yoast’s main settings, and there are also a ton of great settings and options on the individual posts editing pages. Definitely check it out, and let us know if you have any trouble with any of the above!